Many cultures encourage people to use a salt water rinse. It is believed that a mixture of table salt and warm water can help kill bacteria in the mouth. Rinsing the mouth with salt water can also help loosen deposits of food that have been caught between the teeth, making it a valuable addition to your brushing and flossing regimen. How to use salt water as a mouth rinse? Is it as effective as commercial mouthwash? Those that support the use of a salt water rinse instead of a commercial mouthwash note that a salt water rinse is more cost effective than purchasing a traditional mouthwash. Salt water rinses are also much more environmentally friendly than a regular mouthwash, making it easier to use regularly. Using a salt water rinse is commonly recommended for people that do not have a regular mouthwash available. You can easily prepare this mixture when you are out camping or if you realize you are out of mouthwash right in the middle of your oral care routine. Salt water rinses are also ideal for people that cannot use mouthwashes that contain alcohol or other products that disturb people with sensitive mouths. You can continue your regular oral hygiene routine without forcing yourself to be subjected to ingredients that cause you discomfort or may cause an allergic reaction. A basic salt water mouth rinse can be created by allowing a small amount of salt to dissolve in warm water. As little as half a teaspoon of salt in a full sized dinner glass can be enough to kill off bacteria in the mouth. However, it is important to create a mouthwash that is not too salty for you to manage. Many people find it easier to start out with a smaller amount of salt and gradually increase the strength of their rinse as it becomes easier to take. 1. Sip a bit of the liquid and hold it in your mouth, gently swishing it against the gums. 2. You can swish it through the rest of the mouth more vigorously. 3. 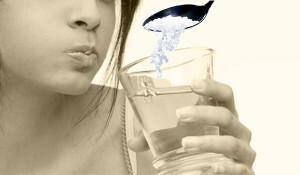 Swish the salt water in your mouth for around thirty seconds and then spit it into the sink or our repository of choice. 4. If you like you can use a second sip to rinse for another thirty second round afterward. This motion will help remove buildup on the teeth and gums that appears when you eat or as bacteria grow in the mouth. 5. Once this is finished you can continue brushing your teeth and flossing as necessary. Do not use salt water as mouth rinse too frequently as salt water is acidic in nature, which could erode the teeth if used every day. The acidity could soften the teeth enamel, making them susceptible to chipping, wearing and cavities.